These threads come up every year and I have yet to see a single person do it. Only person I ever heard of was on the mastercraft forums. There was a guy with a 2003 30th anaversery prostar 197 that he had supercharged. It was the 6L vs the 5.7 but may be a starting point. If you look throught the team talk archive you can probably find him he was a frequent poster. He was in texas if I remember corectly. To cover some other effects of adding a supercharger, I suggest adding the amount of weight the SC is going to add in the engine bay and doing an A-B ski run test to compare the effect on the wake. You can do that with fuel pretty easily. Just an FYI - a camshaft upgrade does wake up the engine quite a bit. 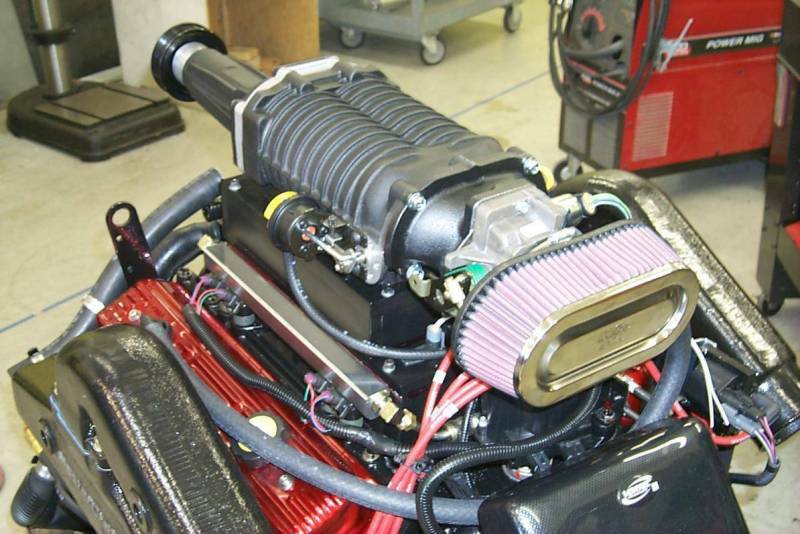 Have you checked your WOT running with and w/o the existing spark arrestor, that can be a restriction. 7,000' elevation is 81% sea level air density, so a loss of 19%. They are listed for the Merc's so you may have to change you ECM / harness to a merc or use your own tuner. Whipple even lists a version for the scorpion which is used in the V-drives in some wake boats. In their instructions they tell you to ship them your ECU so they can reprogram it. Wonder if they can program the Indmar MEFI's. That would be nice if they could. Makes you wonder how much the monsoon could take and what the trans V-drive is built for. Has anybody had any experience with a tuning chip like this? That's not a tuner. You could build the same thing for about $20 in adjustable resistors and some l.e.d.s. It isn't changing the fuel mapping or timing, it's just modifying the signal from the sensors shown to the factory computer to 'cheat it'. You are still limited to the factory computer's tune and adjustment parameters. Worthless. Here ya go, they are shooting for the MCX right now but bet they would build anything you want. Interesting, wonder if they are for real? Showing a blower sitting on a motor on a stand is a start. Looks like they posted that thread and then disappeared completely a week later. Call the company. They are for real. If memory serves, they had a long track record of supercharging street cars. According to that post they are the ones who supercharged the anniversary 197 for a MasterCraft pro. This is from the 35th anniversary 197 they did. Nice to see the guy that owns(ed) that boat sticking up for the company in the thread. Although I remember from years ago when he was running it regularly there were times it was down for service for extended periods of time and his frustration was real. Seemed like a cool project but not something ready to sell to general consumers. They've had 15+ years to figure it out since then so hopefully it's all good now. 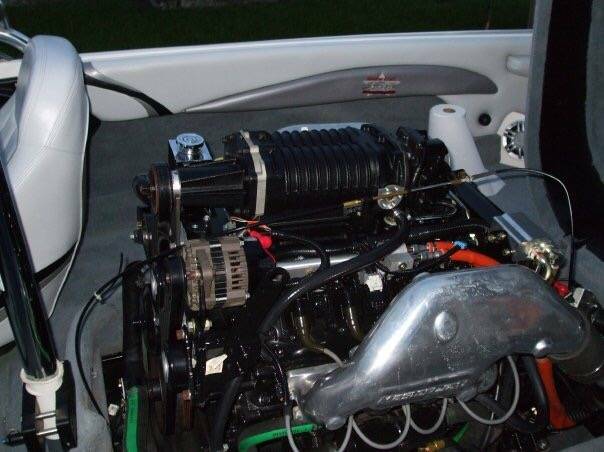 I'd be curious to see the engine in their pictures actually installed in a v-drive boat. It looks awfully tall. Although I'm guessing that intake would not be the final piece since it looks like a bunch of bolted together aluminum plate. I know for sure that setup would not fit in my 2012 vtx. HI guys thanks for the input. I am running aa ACME 1235 now which has been the best solution so far. It will get to 36mph at WOT but when I start making my pass it drops 1mph each cut until 32mph which it can maintain. This is not going to work for my skiing. I have a whole race/hot rod crew willing to take on the project of adding extra horse power but as was mentioned in this thread they are not sure about the ECM controls. We are wondering if we can tap into the controls and make adjustments or swap out the ECM completely for one we can tune or if anyone has done something like this in the past? Another thing to consider is what speed control you're planning to use, if any. If you go custom ECM, you may lose the ability to use the built-in Malibu cruise and you definitely won't be able to use ZeroOff. FYI - they are for real, Technical Services did the calibration work for Indmar for many years and probably still do it (I spent some time with them several years ago on the water while they were evaluating various calibrations). They know their way around the ECM and the marine application. Looking at their website, it looks like they do a lot of oem r&d type work. Actually sounds like they do some cool stuff. Well I just shipped my ECM to CBM Motorsports in California to get it paired with their tuning software. They are very confident they will have no problem getting it to work for us to make adjustments. Both the guys at CBM an my guys think we may not even need to add the supercharger if we can tune the motor for our altitude. I will let you know when we get it back and how it goes.